These cupcakes are so yummy, but be prepared for a serious sugar high after consuming even just one of these. I came up with these after seeing a malted chocolate cake in a magazine. The first time I made them I put malted milk powder in the batter as well as the frosting and it was too much. Ever since, I've settled on chocolate cupcakes with malted chocolate frosting. I use Martha's One Bowl Chocolate Cupcakes from her Baking Handbook. The recipe I created for Malted Chocolate Frosting is what makes these stand apart. Add butter and 2 T water to mixer fitted with the paddle attachment and turn on to medium low. Sift powdered sugar, cocoa and malted milk powder together and add to the bowl in four small additions. Add additional 1 T water if needed to loosen frosting. Sift together first six ingredients in mixer bowl fitted with the paddle attachment. Add remaining ingredients and mix until well blended. This batter always seems runny to me, but it works out perfectly. 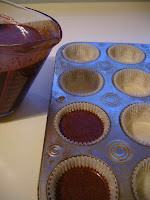 It's easiest to get it into the cupcake pan if you pour the batter into a large measuring cup first. Fill the muffin cups about 3/4 full and bake for 25 minutes. Be sure to cool completely before frosting and topping with malt balls. 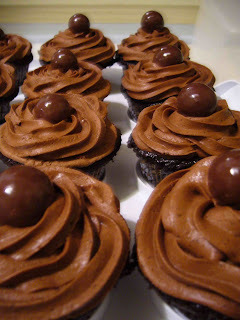 I love chocolate covered malted milk balls, what a creative way to incorporate the flavors in a dessert! My name is Soila Perea I was browsing internet and found your blog. The author did a great job. I will subscribe to your RSS feeds. Thank you for your contribution. I am a web designer myself. And here some examples of the websites that I designed for cash advance payday loans in canada company.